I have finally gotten my hands on a Vitamix and I’m never letting go. In the two short weeks that I have had this little beauty in our house I have used it every day. The best part about this blender, aside from the obvious amazing ability to liquefy everything it comes in contact with, is the fact that my husband loves it too. Eating healthy has never been so easy and delicious. I have had the Vitamix for about 2 weeks now and have used it at least once a day since then. Every morning involves a smoothie, I make my own almond milk to put in my coffee, I make dessert, sauces, and of course a spectacular soup. I am still getting used to the power and temperament of the blender, so my recipes will take a little time to perfect for public use. 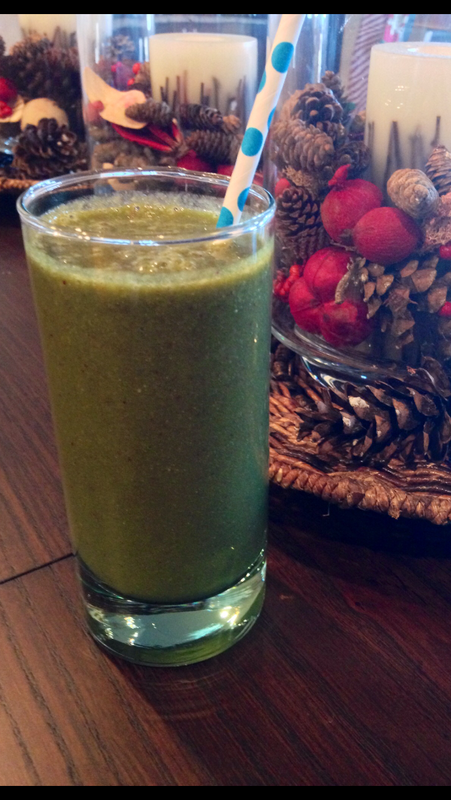 I do have to say I was not a true believer in the Vitamix until I actually put it to use. I thought our old blender was great, it blended things and if I left it running long enough the contents would be smooth. Apparently I didn’t know what smooth was, because the vitamix makes everything so smooth it actually becomes creamy. 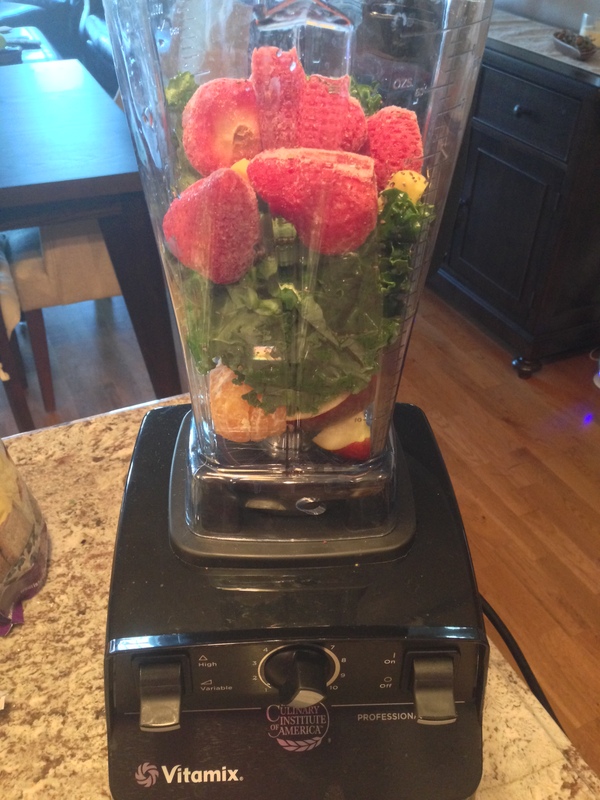 Okay, enough bragging about my new toy, lets get to the smoothie of the day. Today I made a green smoothie with a small chunk of fresh ginger to give it a nice little spice/kick. I am of course not reinventing the wheel here, a smoothie is a smoothie. Green smoothies are all the rage as they are said to break up greens such as spinach and kale into small enough pieces to digest all the nutrients. Something about breaking up your food into liquid form has made me really look more closely at what I am buying as well. 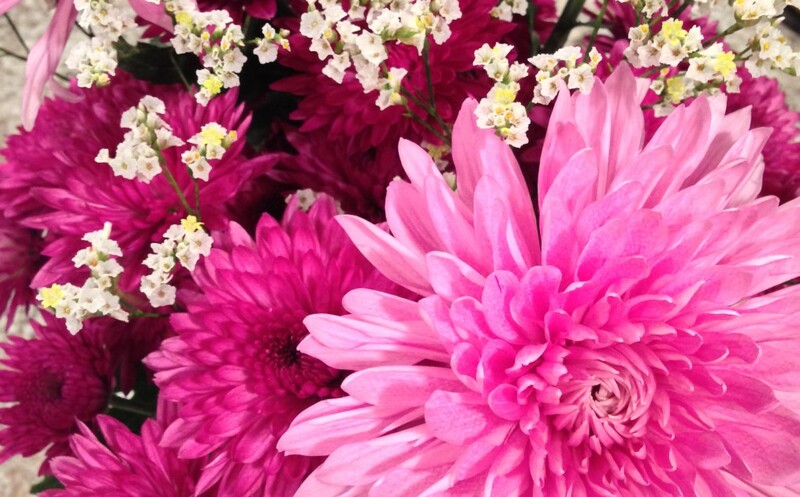 If I am releasing hidden nutrients, I am probably releasing hidden chemicals as well. So not only have I jumped on the Vitamix wagon, I am looking around inside the organic wagon as well. I have chosen for a long time to believe that if I wash my fruit/veggies well enough that it’s totally fine, but in reality those chemicals are likely penetrating into every bite. So I have started to switch to organic greens and slowly switching out my fleshy fruits/veggies as well. 1. Add all the ingredients to the blender in the order listed above and blend on high for 45 seconds. Add more water or ice as needed for consistency desires. 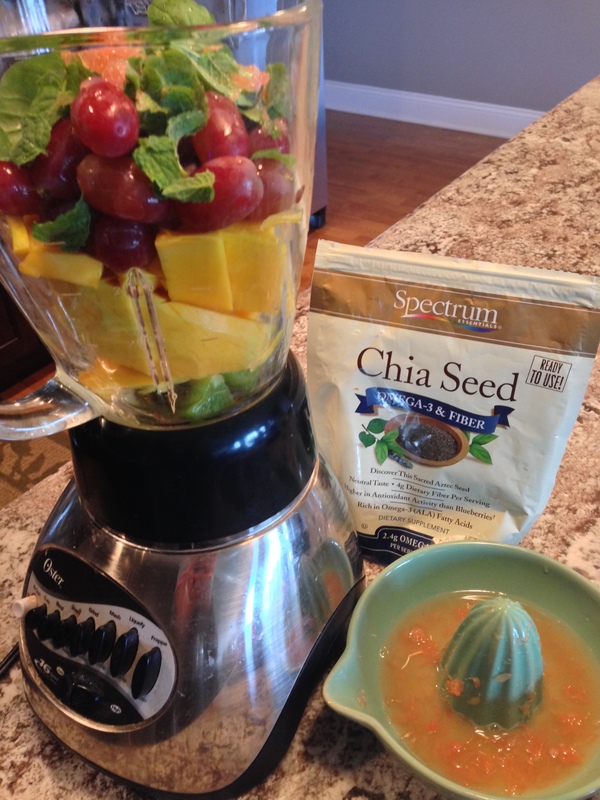 After my first fall morning run I wanted a satisfying and refreshing smoothie to continue the healthy start to my day. 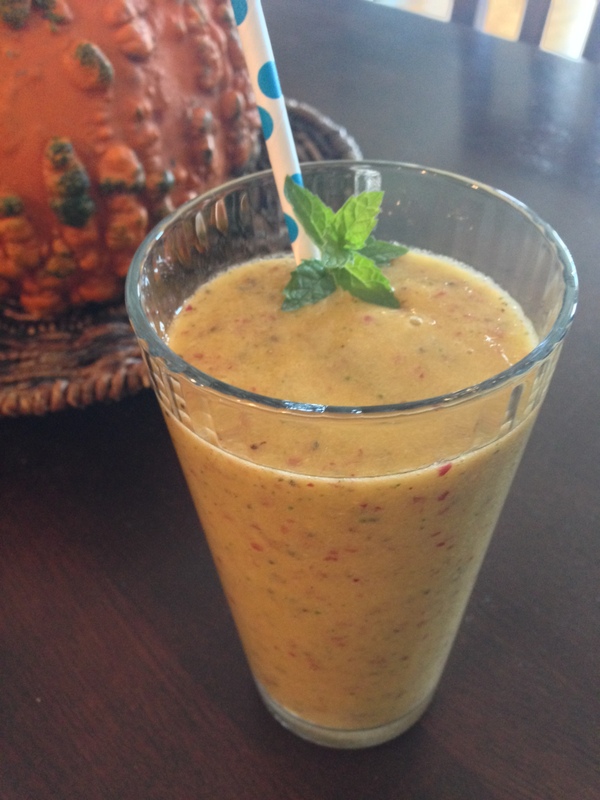 The best part about a smoothie is that the combination possibilities are endless. Today I used some fruits found in the fridge and fresh herbs from the balcony, the combo was everything I wanted and more. Pt everything in the blender and blend until smooth. Garnish with fresh mint leaves if desired. 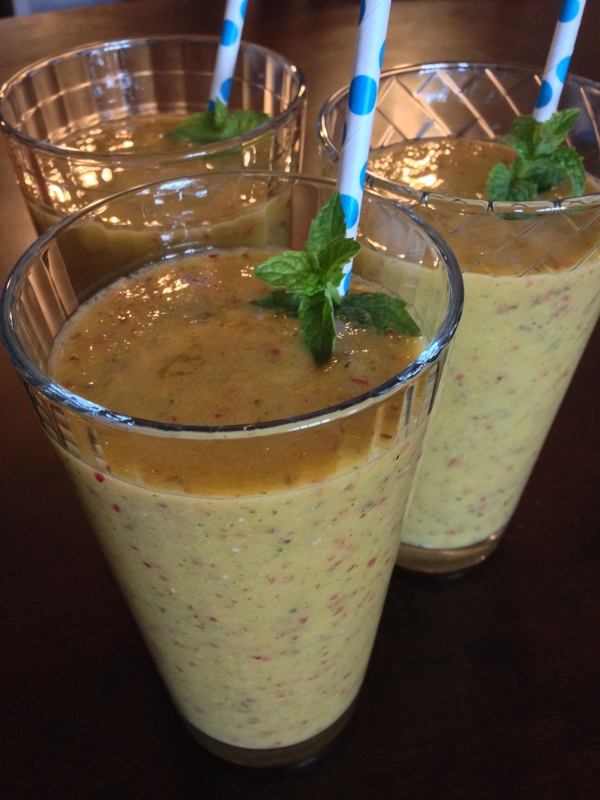 Makes 3 smoothies, so share with a friend or two!